Dipped my toe back into Elite a little last night to participate in a CG that I ended up missing because it finished this morning before I could deliver my cargo. Some friends are suggesting I get WoW. I’ve never had an MMORPG keep me for more than a week but someone made the point that it’s different with a group. And I’ve never really played one with a group. So maybe it’d be different? I don’t know. I’m noodling on it. Are you getting back into WoW for Legion? Let me know in the comments. AND TELL ME WHAT ELSE YOU’RE PLAYING! I’m back at work and this past week was a bit busy! Also, I so colossally hogged the TV the week before, I didn’t want to take it more after getting off work. I do have Remote Play on my PC so I might put some more time in No Man’s Sky if the PS4 is otherwise free. I’ve really been on a Star Trek kick too. I’ve torn through some DS9 the past few days and I’m thinking of hitting TNG after. Then Enterprise. I liked Enterprise. Come at me, bros.
I’ve been loving No Man’s Sky over the past week. It’s like it was built for me. If you look at the subreddit or other various community places, though, you get a very different reaction. It seems a love or hate thing. Some people feel lied to about what kind of game they were getting. I think that’s kind of silly. Unless you didn’t pay attention to anything the developers showed or spoke about, I don’t understand where some of those preconceived notions came from. In any regard, I don’t feel lied to. I think it’s an amazing game that’s well worth the $60. I’ve already gotten more play time out of this game that some others with the same price point. Everything from here out is just gravy. Sweet, sweet gravy. And biscuits. That said, of course there’s some stuff I’d like to see fixed/tweaked. Apparently there’s already a patch in test for frame rate drops. PC users can already try it out through Steam. I’m not sure what all will be in that new build, but here are some things I’d like to see fixed or done differently. not 100% sure if I’m missing something by this rarely being connected…but it’s red and I don’t like that. I haven’t run into a bunch of legit bugs. Big ole blob of Heridium sticking out of the ground that I can shoot from the ship. This would basically be new content…I’ve think I’ve already unlocked all the potential upgrades and components available. I’d love to see the boltcaster (and anything that requires power) go ahead and recharge itself when it runs out. Especially when I have 4 sentinels on me. So if I’m considering swapping ships with a crashed on I’ve found or I’m pondering the correct answer at a monolith, don’t hassle me bro. Messing around in my inventory? Sure. Come at me. After a couple of hours on a planet you accumulate a good number of way-points. Only way to get rid of them is to visit. I’d like to be able to deactivate some and then switch them back on when I’m ready to do new stuff. This is especially beneficial if you decide to hit up a new planet. I’m all about increasing my standing and taking out pirates. But if I’m coming up on one that’s between me and the cargo ship, just one bolt gone awry makes me a pirate. What are some things you’d like to see change? I’ve put a lot of hours into No Man’s Sky this week. Taking off work to really spend some time with it was a great idea. I go back tomorrow but I feel good about my staycation. It was really nice to just chill and unwind with what turned out to be a pretty fulfilling game. A very Happy Birthday to Hammer Wing Commander, Valthonis! Head on over to twitter and wish him a good one. You’d be hard pressed to find someone as awesome as he is. Great guy. What are you playing? Let me know in the comments. I’ve never really felt comfortable recommending games. Chiefly because if they spend their money on it and don’t like it, I’d feel responsible. I supposed that’s part of the reason I’ve never really done “reviews” of a game on here, rather than just talk about my experience. I think Sean Murray summed up his own game perfectly. Quick little update whist I get ready to stream some more! It’s hitting all the right notes for me, guys. There have been a lot of back and forth on love it or hate it online. But at this point I’m in love. I think it’s well worth the price of admission because I anticipate many hours of fun out of this. I streamed the first 2 sessions on twitch. I’m exporting them to youtube so I don’t lose them. Planning on streaming some more today! Above is my current ship. I had forgotten that I got a code for the pre-order and swapped out my starting ship for this one. They’re really only different in look. But I like the look of it. All in all I’m really pleased with the game. I’ll try and write up a more detailed overlook this weekend when maybe I’m not flying through space. Check out twitch.tv/kameco if you’ve got time to stop by! Say hey and I’ll name something after you! There was a community goal. A station named Jaques needed supplied desperately. I come out of a looooooong hiatus of Elite and decide to go for it. Joined it when it was nearly over. Jaques is unfathomably far from the bubble. Most everyone that took this journey was flying for 20s of hours to make it. Often losing cargo along the way from all the natural hazards of space. I flew for 2 hours straight. Honk, scoop, and high wake to the next system. I got 1000 light years away from the bubble. It was the furthest I’d ever been from civilization. I called it a night. I suspected I wouldn’t make it there before the goal was met. I was right. In the middle of the night, it ended. I wasn’t even a quarter of the way there. The scale of this game just astonishes me. Probably rivaled only by No Man’s Sky…which I just started playing today. I haven’t gotten the chance to really experience but two systems in No Man’s Sky but man…I expect it to be massive. So I turned around. I wasn’t outfitted to make a journey like that. It’s very likely if I’d kept going I would have only gotten maybe have way before getting myself blown up. 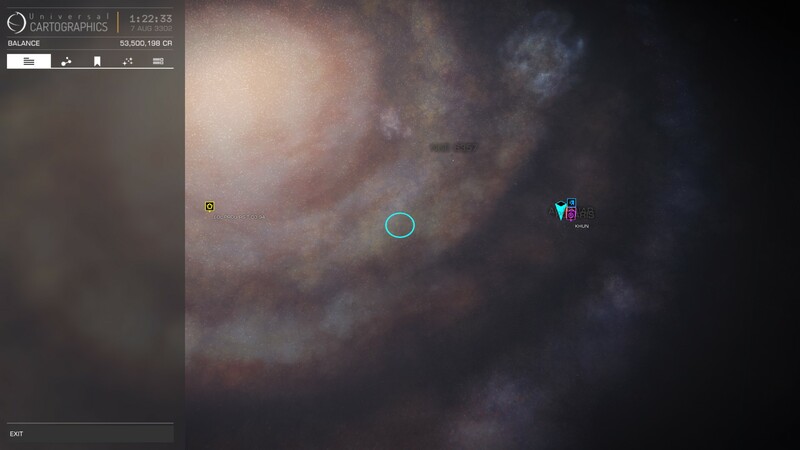 I’ve made my way to a system in the bubble that had a community goal for turning in bounties. But I doubt I’ll be getting back to Elite before it’s over. I may see if I can jump on there just long enough to turn in what I’ve collected. Until then, here are some screens!